There are many musicians that aren’t as well-known as they deserve to be due their musical talent. I could say many names, but I’ll speak only one: Joe Lynn Turner. Yes, although he sang exceptionally well on RAINBOW, YNGWIE’S MALMSTEEN RISING FORCE, and others, but when a weak work was released by the band, he took all the blame (besides he was only the singer, and never the composer, as all know about Yngwie Malmsteen and Ritchie Blackmore’s egos and careers). 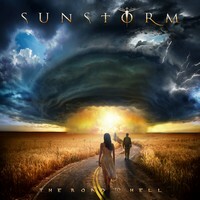 Now, for our pleasure, the fourth album from SUNSTORM, “Road to Hell”, is finally at hand. Obviously on the album, you’ll have the same old and good Classic Rock/AOR that we are used to know of his albums. Here is not an exception, because the songs were created with charming melodies, catchy choruses and a strong instrumental basis (Simone, Nik, Alessandro and Edo are amazing musicians), what makes us all take the best from band’s talent. How lovely are these songs, the energy, the 80’s feeling is strong, but never outdated. The keyboardist Alessandro Del Vecchio made the production and mixing of “Road to Hell”, and the mastering was done by Maor Appelbaum. So it’s not unexpected to have such wonderful sound quality, with everything clear and with its right instrumental tunes. Even with this 80’s feeling, the sound quality is truly heavy in some parts. It’s truly a great work, let me tell you. Musically, all sounds great, with all AOR elements that a fan could expect. The best thing to do is to play the album from the beginning to its end, because all the songs are really amazing. But if you really need some references, the excellent melodies and weight parts of “Only the Good Will Survive”, the heavier and climatic “The Road to Hell” (what great keyboards parts and great chorus), the accessible melodies of “On the Edge” (great guitars, indeed) and of “Blind the Sky” (of course the vocals are amazing on this songs that would be the right one for cigarettes’ commercials back on the 80s), the elegant and charming harmonies that “My Eyes on You” show (with fine parts done by bass guitar and drums), the intense and hypnotic melodies of “Future to Come”, and… Oh, come one, boys and girls! Don’t make me waste more time, because all songs are really great, you’ll love this album at the first listen. “Road to Hell” is an amazing album, and can be on the list of the best records of the year.